This first CODARTfocus, organized in cooperation with the Dordrechts Museum and Museum De Lakenhal was attended by a group of 30 participants, which included CODART members as well as HNA (Historians of Netherlandish Art) members. The day started at 09.30 a.m. with a word of welcome by Gerdien Verschoor (director, CODART) who also excused Peter Schoon (director, Dordrechts Museum and Van Gijn House) who was ill and could not be present. Hereafter, participants were split up into two groups for an intensive and thorough visit of the museum under the guidance of Sander Paarlberg (curator of Old Master paintings, Dordrechts Museum) or Suzanne Harleman (head of collections, Dordrechts Museum). During the visit, they not only discussed a large number of works, but also gave extensive information about the renovated museum and its new areas. Each gallery now has its own specific character and theme. The unique and tasteful design, carried out in detail throughout, enables an optimal presentation of the works. Each gallery has been treated individually with different colors and applications such as silver stencilled patterns and modern lamps made of Murano glass are used. Their delicate forms refer to classic chandelier shapes, but are at the same time sleek and contemporary in design. Furthermore, beautiful and functional cabinets of drawers that can be opened by visitors, contain prints, drawings, miniatures and memorabilia. Visitors can also enhance their knowledge with the help of computers provided in the rooms. Sander Paarlberg began his guided tour in the Van Strij period room, which has a light, open construction, in which the large decorative paintings are displayed in their original arrangement. The very high quality paintings of Van Strij give a beautiful impression of country life of the time. After visiting a few of the galleries, including one devoted to still lifes, the Schouman and the Cuyp galleries, the restoration studio was visited, where technical information was given concerning two paintings standing ready for restoration. Thereafter close attention was paid in particular to works from the 19th century and early 20th century. The new wing offered the exhibition Collectors in Dordrecht. Various galleries were classified by collector, in which, among others, beautiful works by Breitner, Toorop and Weissenbruch could be enjoyed. The museum also owns the contents of Ary Scheffer’s studio, which is shown in alternating exhibitions in two galleries with completely individual atmospheres. The one gallery has a set of large windows and is quite sober in order to accommodate the collection of bronze sculptures and gypsum models by Scheffer and Princess Marie of Orléans (who received classes from Scheffer from an early age). The wall covering of the other gallery is made of a special red fabric that emphasizes the classic and intimate atmosphere of the works, as a result of which the impact of the deathbed portrait of Scheffer’s mother is intensified. The Dordrechts Museum’s collection is extensive and of course it was impossible to see everything, but the morning spent there gave an excellent impression of the richness of the different collections within the museum and smacks of more. In the afternoon, the Lucas van Leyden exhibition was visited in the Lakenhal in Leiden. The director, Meta Knol and curator Christiaan Vogelaar, welcomed the participants. The group was thereafter split into three to be guided by Christiaan Vogelaar, Jan Piet Filedt Kok (former chief curator of early Netherlandish paintings, Rijksmuseum, Amsterdam) and Huigen Leeflang (curator of prints, Rijksmuseum, Amsterdam), whom with their expertise and interests shed light on parts of the exhibition for the participants. Groups then switched every half hour in order to receive each talk from the inspired guides. Jan Piet Filedt Kok started with the works of Van Leydens’ master, Cornelis Engelbrechtsz., in which he pointed out the detailed underdrawings. He also spoke of his intensive search for paintings whose whereabouts were at first unknown, but now are included in the exhibition. Jan Piet also related to his efforts in trying to reconstruct the oeuvre of a painter from the circle of Van Leyden with the pseudo name Meester J. Kock. 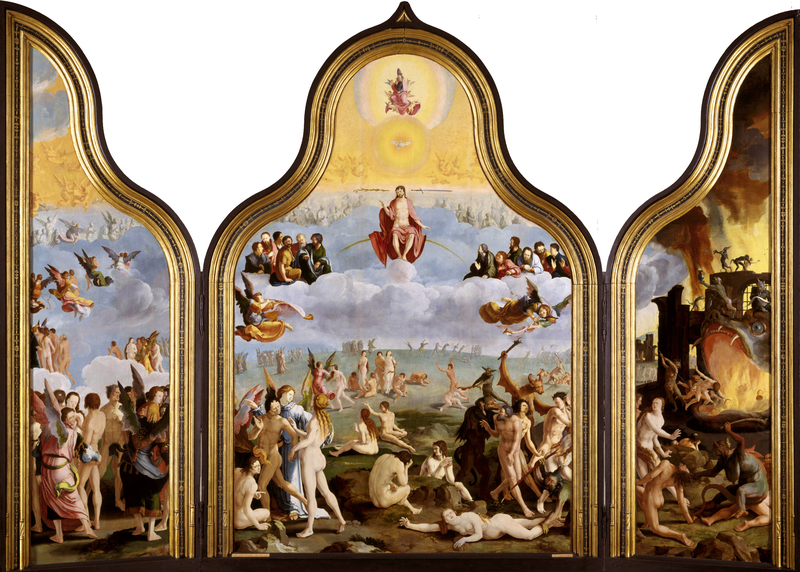 Christiaan Vogelaar focused on the three altarpieces of Lucas van Leyden and the stained glass windows of his time. He discussed various drawings which could have served as examples for the windows, and when asked, also spoke of the technique of glass engraving and enamelling. Huigen Leeflang led the participants along the prints and drawings of Lucas van Leyden and other artists of his time and pointed out the exceptionally high quality, drawing-like technique that Van Leyden employed in his graphic work. He used copper plates wherein a fine set of lines was engraved to depict the scene. His extraordinary engraving technique is unrivalled and gives his prints an almost unearthly beauty. After some questions regarding various techniques, Huigen went into further detail on the use of a combination of etching and engraving on copper plates. In the example of the portrait of Emperor Maximilian I, this technique was employed by first etching everything but the face, and then delicately engraving the face. Lucas van Leyden applied this technique for only a few years, but it demonstrates how far he went in experimenting with techniques and in turn, how the quality of his graphics was brought to such high standards. Participants were then given time to see the exhibition at their own pace, after which a very successful day was brought to an end with drinks and a word of thanks by Gerdien Verschoor to the two museums for their cooperation and for opening the museum especially for the group on this Monday, when it is normally closed to the public. In this way, participants of this CODARTfocus were able to concentrate on the works and the information shared by the curators undisturbed. Gerdien further mentioned the intention to organize this kind of meetings on a regular basis, which will surely lead to a broadening and deepening of knowledge in the topics offered.